No matter what I am eating or where I am, you can probably catch me taking a picture of the food I am about to eat. My iPhone camera roll is filled with hundreds of pictures of restaurant meals, home-cooked dinners, ice cream cones, and the clean plates afterwards. What’s my favorite kind of food to snap a pic of? Restaurant food! I love going new restaurants, trying new foods and taking pictures of the overfilled plates piled with loads of yummy goodness. That being said, restaurants can definitely be huge deal breaker when it comes to eating healthy. The long menu with many greasy, gooey, delicious options (that are very photogenic) can be tempting and make eating healthy a challenge. Look at the menu ahead of time. Pretty much all restaurants have a website with their menu. Take a peak and plan what healthy item you are going to have. 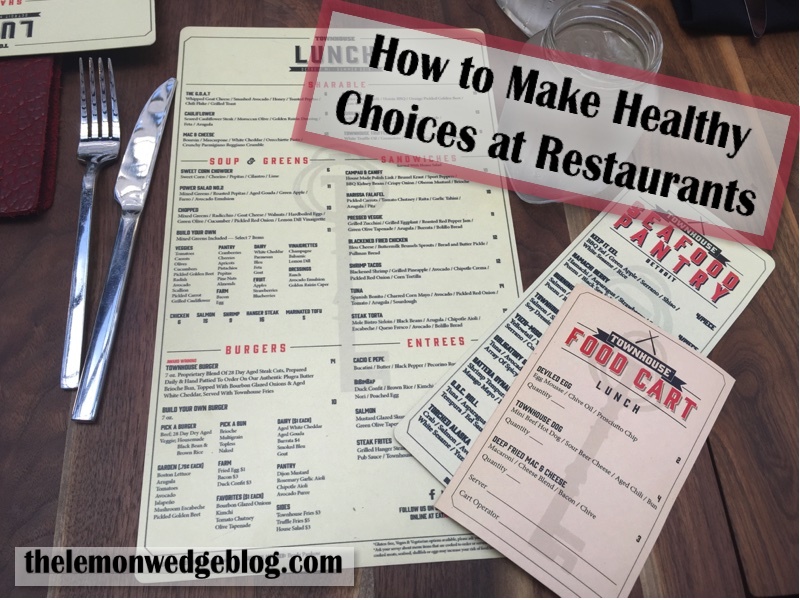 If you already know what you are going to order, you are less likely to be tempted by the unhealthy options once you get there. Also, knowing what you eat will help you plan your food choices for the rest of the day. If you know you are going to have chicken and pasta for dinner at a restaurant, you should try to squeeze in some extra fruits, vegetables, and whole grains throughout the rest of the day. Eat a balanced meal. No healthy choices? Try to get a meal the combines fiber and protein. While some grilled chicken with vegetables and brown rice would be ideal, if breaded chicken is the only option that is still better than having a bowl of white pasta, which has little nutritional value. Make menu swaps. Instead of French fries, get roasted sweet potatoes. Swap pita bread for fresh veggies. Making these small changes can make your meal significantly healthier by decreasing calories and increasing nutrient content. My favorite menu swap is ordering grilled veggies in place of french fries to go with my chicken or fish dish to create a well balanced meal. Don’t overeat. Restaurants often serve outrageously large portions, so don’t be afraid to ask for a to-go box. You might even want to do this before you start eating. Food tastes better when you aren’t forcing it down your throat so take your leftovers for lunch tomorrow. That’s one less meal you have to cook, too! Most importantly, eat something you will enjoy! There is no point in ordering a boring salad if you aren’t going to enjoy it. If the restaurant is known for their burgers and that is what you want, go for it! But maybe you have to make some adjustments throughout the rest of the day. Eat a smaller lunch if you are going to have a big dinner, or ditch the late afternoon bag of chips and save the calories for that burger.